Something between a teacup and a mug, this item stands 2" high to the rim, 2 1/2" to the top of the handle, has a top opening of 3" and a rolled rimmed base 2 3/8" in diameter, and weighs approximately 3.7 T. oz. It was made by Dominick & Haff in 1891, as indicated by the company emblem with date imprinted on the underside, and retailed by Rand & Crane, both firms of New York City. Other marks include "Sterling" and model number "135." A late 19th century pattern produced by Dominick & Haff, "Trianon" is as fully French in style as its name implies. It is replete with scrolls, acanthus leaves, and delicate leaves and flowers, all under a rococo mantle and set in moderately high relief. There were two versions, one with a solid background and one pierced. This 6 1/4" long, .9 T. oz., youth fork is the latter. A late 19th century rococo pattern produced by Dominick & Haff, "Trianon" is as fully French in style as its name implies. Made in two versions, solid background and pierced, it is replete with scrolls, acanthus leaves, and delicate leaves with flowers, all set in moderately high relief. 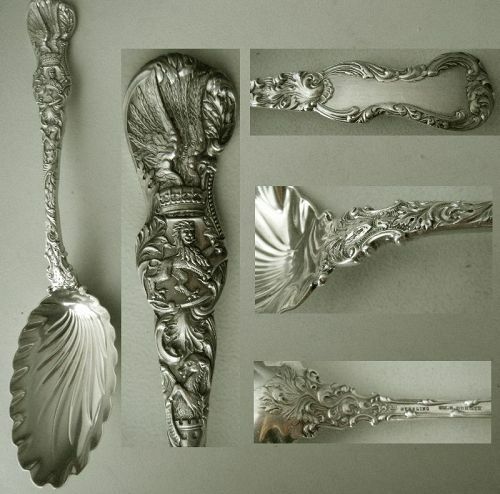 A generously proportioned piece, this sterling spoon measures 9 1/8" long and weighs 1.9 T. oz. Its origins are Irish, with hallmarks indicating it was made in Dublin in 1821 by Joshua Buckton, as indicated by the "I pellet B" imprint. James Brady also dates from the same time, but his mark is absent the pellet. 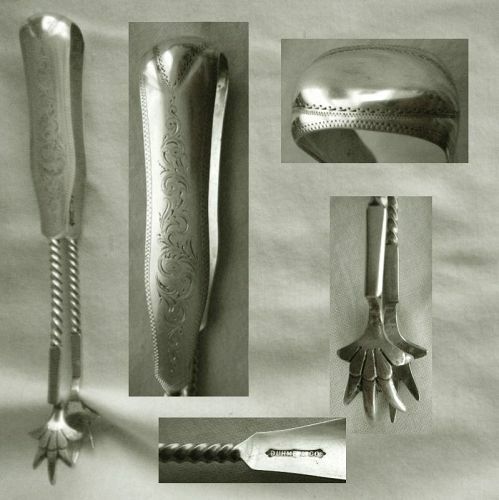 It is an "Old English" pattern, with a down-turned, reverse tip handle and a thumb drop on the bowl backside. A relatively long piece at 8 7/8", and weighing 2.0 T. 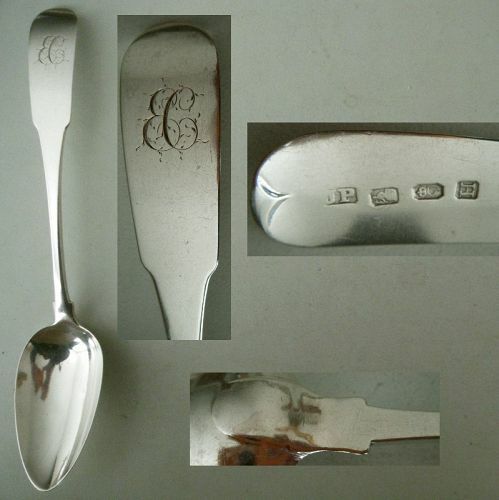 oz., this spoon is fully hallmarked for Dublin, Ireland, sterling, 1804 and "JP" for maker John Power. It is an "Old English" pattern, meaning it has a downturned handle with a reverse tipt back and an exposed drop on the bowl heel. There is a feathered script "EC" monogram on the front. Tracing to the mid 19th century, this pair of coin tongs are early production items from Cincinnati's premier silver and jewelry house, "Duhme & Co.," as indicated by the stamp on the inside of each arm. They are large at 6 5/8" long, and heavy at 1.7 T. oz., and combine a variety of period design elements. They may be pickle tongs, for use with a tall caster. The lower portions of the arms are blocky where they join with the substantially-scaled talon grips. Cincinnati, Ohio's Duhme & Co. offered numerous patterns that were teasingly close to those produced by other manufacturers, enough so that it raises the question whether these designs were copies or produced by third party firms for retailing by Duhme. This 6 1/8" long, approximately 1.0 T. 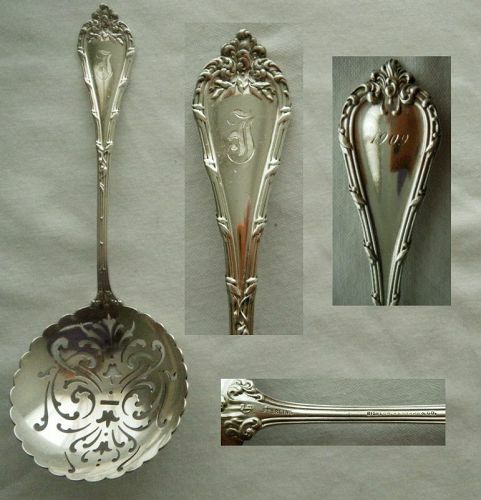 oz., sauce or cream ladle is an example of this practice. The rarely found pattern is a very close match to Whiting's "Berry," introduced in 1880. An unnamed pattern, this Durgin design is sometimes referred to as "Baroque," "Pierced Design," or other name derived from its attributions. 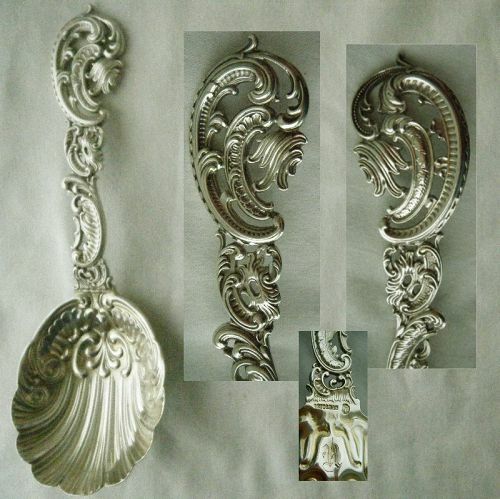 Presenting with a dramatic and bold look, this 9" long serving spoon is large and very heavy at 4.3 T. oz. 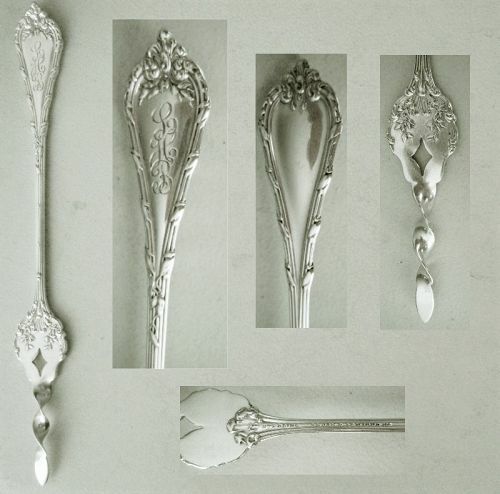 The handle is cast, and as indicated above, incorporates an intricate, asymmetrical, rococo, pierced design, which overall appears as quite grand. Large at 8 9/16" long, and weighty at over 3.1 T. oz., this pea spoon has a generously scaled, round, 3" diameter, 7/8" deep, bowl. This has intricate scroll and bell flower piercing and a gold finish on both sides. Made by Durgin, the pattern is "Bead," which was introduced in 1893. The design incorporates a beaded border on the handle, which has a tipt end on the slightly upturned front and a plain end on the back. There is an Old English "H" monogram. A captivating and not commonly found design, Durgin's "Bouquet" is one of that company's first full line patterns, issued in 1875. Multi-motif, it features a variety of dense, low relief, floral images, all portrayed on irregularly shaped handles with a raised border on the backsides that resembles bamboo. This detail suggests an Aesthetic influence, and is some similar to Tiffany's "Lap-Over-Edge," introduced five years after "Bouquet." A large item measuring 9 3/8" long and weighing 2.5 T. oz., this serving fork has four tines, the outer two of which are notched. The serving end has a cupped heel with decorated shoulders and is finished in a gold wash front and backsides. The pattern is "Empire," which is a late 19th century design that incorporates imagery suggestive of majesty, nobility, and imperial realms. This includes a dominant crown, cornucopia, a torch and flame, a wreath and festoons of ribbons and flowers. A fully authentic item, that is, not made up or adapted from another piece, this butter pick measures 6 3/8" long and weighs approximately .6 T. oz. It is an early example of Durgin's 1910 "Fairfax," marked with the company "D" emblem, "Sterling," and "Pat'd." It has a fancy script "F" monogram on the handle front, and a pierced and twisted single tine end that is finished in a gold wash.
Imprinted with the "D" emblem that Durgin used on its holloware and the word "Gorham," along with "Sterling" and the model number "34A," this piece was made subsequent to 1905, the year that Gorham bought out Durgin, which continued as a separate operation under Gorham's mantle until 1931. It is a 4" long, 2 1/2" wide, 1/2" high to the rim, 3 1/8" at the tallest, nearly 1.4 T. oz., nut or candy dish formed in the shape of a swan. An expressive and detailed high relief design, Durgin's 1888 "Heraldic" incorporates many images appropriate to the name, all of which show particularly well at the scale of this 9 1/8" long, weighty at 2.5 T. oz., (salad) serving spoon. The iconography includes a pair of upraised (presumably eagle) wings that appear to rise out of a crown, which itself sits over a lion rampant on a shield. Lastly, there is a rearing steed projecting out of a castle turret set below the above images. Issued in 1891, Durgin's "Louis XV" is a dense design that reflects quite a different, and more complex, interpretation of the motif from Whiting's much simpler pattern of the same name produced in the same year. This example is a 7 7/8" long, relatively weighty 1.0 T. oz., lettuce fork. A 6 1/2" long, .6 T. oz., piece, this butter pick has a pierced and twisted end. It is a fully original piece, i.e.not made up or custom, produced by William B. Durgin in its 1897 "Madame Royale" pattern. The scroll, leaf and berry design borders the handle and flat area of the pick, repeating on the backside of the handle but not the pick. There is a script "LHB" monogram engraved on the front. All original, this 8 9/16" long, 3.1 T. oz., pea spoon is a rare form. The pattern, "Madame Royale" by Durgin, dates to 1897. It has a lined border with leafy detailing, a leaf and scroll festooned handle tip, with in this instance an Old English "F" monogram. The backside of the handle is inscribed "1909" in script. The 3 1/8" diameter, 3/4" deep, bowl has a scalloped rim and is extensively pierced in the interior. Arguably the line by which all other Art Nouveau floral designs are measured, Durgin's 1900 "New Art" embodies the exuberance, lushness, and fullness of expression that characterizes this style mode. The scale of pieces in this pattern is large, as evidenced by the fact that this 8 3/4" long, very heavy at 4.7 T. 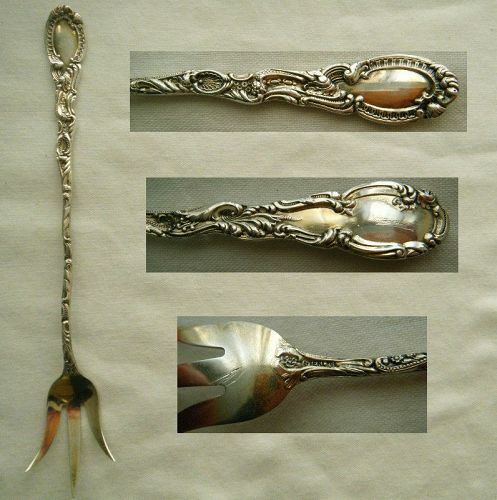 oz., piece is identified as a preserve spoon, when it is actually the size of a typical berry spoon.